i. The person or group hiring the Equipment. ii. Contented Camping with registered offices at Lodge Gate, London Road, Mountfield, Robertsbridge, East Sussex TN32 5LX. iii. Any condition deemed invalid will not affect other conditions. Nothing in the Contract is intended to limit a consumer’s existing legal rights. Equipment hired remains the property of Contented Camping at all times. The stated hire charges stated within this website are for the duration of the Contract and include Saturdays, Sundays and Public Holidays. The first day will be the day the customer can expect to take delivery of the order and the last day will be the day the customer must await the courier service to make collection of the order. Delivery and collections including attempted calls are chargeable. If Equipment is not available or only partially available for collection then the Hirer will be charged for each journey. A cautionary deposit is required for the Equipment before the hire period. Credit card details of the Hirer will be required before the Equipment can be shipped for delivery. These details will be received and stored securely. Once the Equipment is returned to Contented Camping and inspected, if all in good condition, then credit card details are securely deleted within 7 working days of the end of the hire period. Where damage, beyond normal wear and tear, has been incurred, then the repair, extreme cleaning and replacement charges which will be made against the Hirer’s credit card will be as stated in the table hereunder. The Hirer will be notified before payment is taken. Sweep the inside of the tent before you take down your tent. Please ensure your tent is clean and dry before packing away, if you have to repack the tent wet please ensure you unpack and dry before return (normally a night spread out in the living room will suffice). We understand that this isn’t always possible. If we need to do anything more than our normal cleaning service and have to dry and clean your tent when it is returned then a charge of £19.95 will be made. Contented Camping will treat Equipment unavailable for inspection after reasonable notice as lost apply the Hirer will pay a replacement charge for Equipment, as stated in above table. Theft of Equipment must be reported to the Police and a crime reference number obtained. The Hirer must notify Contented Camping within 48 hours of the theft and write to NSPER Enterprises Ltd, 134 Alexander Close, Abingdon, Oxon, OX14 1XD. Delivery of the order to the Hirer’s selected address is the first day of the hire order. The minimum hire order must consist of one tent. Delivery will be made to the Hirer’s preferred delivery address, which may be their home address or place of work. It may be possible to agree for delivery direct to a campsite, but it will be the responsibility of the Hirer to make arrangements with campsite owner. If you wish to collect your equipment please contact us to arrange. Hire charge will start on day of collection. Collection of the order is defined as being on the last day of the hire order. Collection should be from the same address as the delivery address unless agreed. Our couriers work Mon-Fri so if the order is booked for the Saturday or Sunday the parcel will be collected on the first Monday unless another day has been agreed. Payment of any charges or any other sums due under the Contract shall be made within 10 business days of the Hirer receiving confirmation of order for the Equipment. Payment by the Hirer on time under the Contract is an essential condition of the Contract. Payment shall not be deemed to have been made until Contented Camping has received cleared funds. If payment is not received within this timeframe the order will be cancelled and the Hirer will be notified by email. 11-20 days before 50% of hire charges (less a £10 administration fee). Delivery charges will be refunded in full. 2*-10 days before No refund on hire charges. Delivery charges only will be refunded*. *For cancellations less than 2 days before hire start date, Contented Camping reserves the right to charge for delivery if a confirmed booking has already been taken by the courier company. The Hirer will sign to acknowledge receipt from the courier company at delivery. Any items missing or Equipment defects should be reported to Contented Camping immediately by telephone. The Hirer will provide adequate delivery and collection access. The Hirer will make every effort to ensure that the tent is packed only when completely dry, so as not to cause undue damage to the material during transit back to Contented Camping. The Hirer will need to ensure the Equipment is re-packed suitably for courier transportation back to Contented Camping, usually in the original packaging. The courier company will supply suitable labels. The Hirer accepts responsibility for Equipment security until its collection and undertakes not to sell or relinquish possession, alter, repair or modify it in any way. The Hirer is responsible for the safe and correct operation of Equipment (using the pitching and other operating instructions supplied) by competent persons not under the influence of alcohol or drugs. The Hirer will ensure any non-Contented Camping Equipment used in conjunction with the Equipment also conforms to safety requirements. 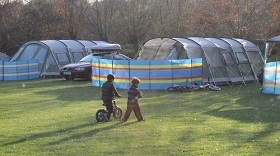 Contented Camping will maintain the agreed hire rates for the duration of the Contract. 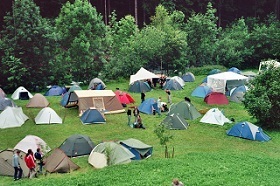 Contented Camping will provide appropriate printed and/or downloadable practical instruction in the safe pitching and correct operation of Equipment. Equipment will be inspected and cleaned after each hire, so it is ready for the next hire in good usable condition. Additional tent pegs and a mallet are supplied with each tent. Contented Camping will instruct its courier company to deliver and collect Equipment as per the days confirmed in the order. Should the courier company fail to comply, Contented Camping will make alternative arrangements in accordance with the Hirer’s and/or Customer’s request. The liability of Contented Camping for claims made by the Hirer does not extend to any unforeseeable financial loss caused by late or non-delivery of Equipment, unsuitability, breakdown or lawful repossession. Subject to the above Contented Camping will be liable for negligence or error in the performance of its obligations under the Contract.